All brass replacement neck for the 1928-29 Model A Ford radiator, ready to solder in place. This is the correct neck that has a ledge for the gasket to seat against! Made in USA. All brass replacement neck for the 1930-31 Model A Ford radiator, ready to solder in place. 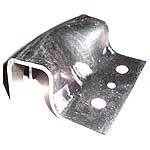 Radiator brace rod bracket for the 1928-31 Model A Ford. This is the bracket that is soldered to the radiator for the brace rods to mount to. Made in USA. 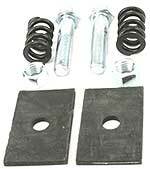 Standard Radiator Mount Kit for the 1928 - 1942 Fords. This is a replacement style kit that uses regular nuts instead of the authentic castle type. Made in USA. Authentic Radiator Mount Kit for the Model A Ford complete with drilled bolts, castle nuts, cotter pins, springs and pads. Made in USA. Radiator mounting Springs for the 1928-48 Fords. Set of 2. Made in USA. Radiator for the 1928-29. A nice 3-row core Model A radiator. Comes complete with neck and outlet. 6 fins per inch, 95 tubes. (Heavy duty model pictured). Heavy duty radiator 1928-29. This radiator has quite a few more fins than our standard radiator which makes it more efficient for cooling. This is a top notch radiator! 8 fins per inch, 95 tubes. Made in USA. Standard 1930-31 Model A Radiator. Comes complete with neck and outlet. 6 fins per inch, 95 tubes. (Heavy duty model pictured). 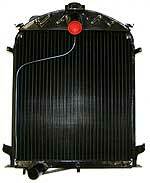 Heavy duty radiator for the 1930-31 Model A. This radiator has quite a few more fins than our standard radiator which makes it more efficient for cooling. 8 fins per inch, 95 tubes. Made in USA. 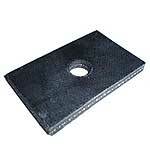 Radiator mount pad set for the 1928-31 Model A Ford. These are the rubber pads that goe between the radiator and the frame. Set of 2. Made in USA. Fan shroud for the 1928-29 Model A Ford. Originally these were only supplied on the early 1928's. 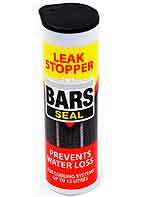 Very helpful in optimizing the cooling efficiency of your radiator . 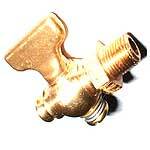 Attaches to the back of the radiator and includes mounting hardware. Black plastic construction. Made in USA. Fan shroud for the 1930-31 Model A Ford. Originally these were only supplied on the early 1928's. Very helpful in optimizing the cooling efficiency of your radiator . 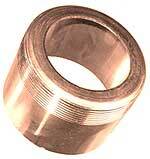 Attaches to the back of the radiator and includes mounting hardware. Black plastic construction. Made in USA.